That phrase was the conversation stopper of a recent discussion I was having with a teacher about assessing student learning. Somewhere along the way, because of new state rules about teacher evaluation and accountability, this teacher had changed the way she assesses her students so that she could get a clean, quantitative measure of what students were expected to learn in her class. And the conversation was difficult to have. Her High School Art students, her excited and engaged High School Art students, had to take a reductive assessment that amounted to little more than definition regurgitation to prove that they had grown in knowledge over the course of their time with this teacher. The students’ pretest was an unknown list of vocabulary words and art terms that they did not know. The posttest was set to determine if they learned those words and terms. If they performed well on this written assessment, then the teacher would be found to be effective or highly effective in her teaching performance. There’s a scene in the 5th Harry Potter film, The Order of the Phoenix, where the Defense Against the Dark Arts teacher, Dolores Umbridge (who works for the Ministry of Magic–insert your own State or National Education Reform Commission metaphor here) refuses to teach practical magic. The students remind her that in each of their previous four years at the school there has been an authentic reason to know how to defend themselves with magic. As long as you have studied the theory hard enough, there is no reason why any of you should not be able to perform the spells under a controlled examination. I repeat, as long as you’ve studied the theory! How does that help us in the real world? This is school, not the real world. The conversation with the HS Art teacher was heading in this same direction. She was describing a system that was trying to measure what was, perhaps, not worth learning; at least not worth learning in isolation. Surely the art terms had some worth contextually but were they the primary target of instruction? No. I walked over to the variety of mugs, in their final stages of drying, before being put into the kiln. 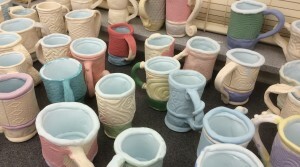 The students had been working for weeks (keeping their mugs in plastic to prevent drying) on perfecting techniques to shape the mugs, the handles, the top lip, and the design of the outside. The teacher explained and demonstrated different techniques and students tried them out, creating their own works of art. Over several weeks and with feedback from the teacher, they came to a point where their work was “Kiln-Ready.” Once it goes into the kiln, it cannot be modified. Is all of this reform we’re dealing with that great in theory? Is what we quantify in the classroom more important than what we qualify? Is doing what is easy more important than doing what is right? Because the reality is, at least in this classroom (and classrooms like it across our country), it isn’t practical. We don’t need more REform. We need more TRANSform. We need more NEW form. We need more Kiln-Ready moments and less Umbridge-style interpretations of assessment. Also, we need to celebrate those teachers, like this one, who understand how important Kiln-Readiness is, in spite of a misguided and ill-informed accountability system.